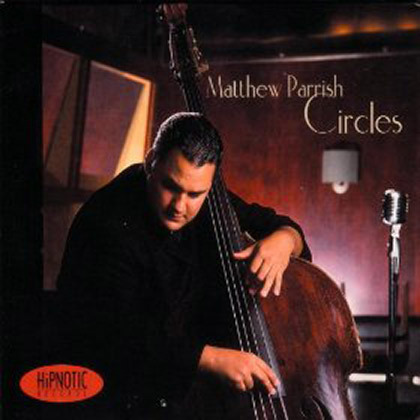 “Matthew Parrish,” according to David R. Adler (AllAboutJazz, Downbeat), “is an exceptionally-gifted bassist-composer” whose debut CD, Circles, represents “an inspired quartet outing” that establishes his place in the “noble lineage of bassist-bandleaders” — a lineage that stretches from Ray Brown, Charles Mingus and Ron Carter to latter day icons like John Pattitucci and Christian McBride. Born in California and raised mainly in New Jersey, Parrish studied trumpet for several years before taking up the bass at seventeen. It was a natural move for a musician whose love for music had been inspired by the sound of Ray Brown’s bass lines on his father’s Ella Fitzgerald records. Parrish began his formal bass training at Rutgers University’s Mason Gross School for the Arts, undertaking both classical and jazz studies under the tutelage of Kenny Barron, Larry Ridley and Caroline Davis. Since his graduation from Rutgers, Parrish, who now resides in Yardley, PA, has performed at prominent jazz venues and festivals throughout the United States and Europe. A regular presence on the New York City and Philadelphia jazz scenes, Parrish cut his teeth on the bandstand at Philadelphia’s Ortlieb’s Jazzhaus, providing “the bottom” for Philly icons like Shirley Scott, Bobby Durham and Parrish’s chief musical mentor, the late trombonist Al Grey, with whom the bassist toured the U.S. and Europe for two years. Parrish has since performed with such notable musicians as Ruth Naomi Floyd, Allan Harris, Pieces of a Dream, Eric Lewis, Orrin Evans, Mark Turner, Ravi Coltrane, Marion McPartland, Harry “Sweets” Edison, Clark Terry, Ralph Peterson and Javon Jackson. In 2003, the bassist toured extensively in bands led by Stefon Harris, Regina Carter, Greg Osby, and David Leonhart. In the studio, Parrish has contributed his rich, soulful sound to numerous recordings including Orrin Evans’s Deja Vu (Imani Records), Ruth Naomi Floyd/Fan Into Flame (Contour Records) and Miri Ben Ari’s . . . w/Special Guest Wynton Marsalis. Parrish can also be heard on Live at the Blue Note w/Miri Ben-Ari & Dave Kikowski, Denise King’s Now . . . Ain’t That Love, Live at Pace University w/Al Grey, Wyclef Gordon & Ray Anderson, Vincent Bourgeyx w/Mark Turner, John Simon w/Clark Terry and Etta Jones, and Miss Justine’s Tasty. He has recorded four CDs with The Onus, a unique clarinet-and-guitar-fronted quintet led by Baltimore-based clarinetist Darryl Harper. The recordings include the band’s self-titled 1997 debut CD, 2001’s Reoccurring Dream, and two upcoming releases on HiPNOTIC Records, the label on which Parrish, in 2002, made his own impressive debut as a leader. Circles boasts the formidable talents of Joel Frahm on tenor saxophone, Vincent Bourgeyx on piano, and Steve Hass on drums. The CD presents eight original compositions by Parrish as well as the bassist’s novel take on three standards: “Seven Steps to Heaven,” the traditional “Go Tell It on the Mountain,” and Duke Ellington’s “Flirtibird.” The recording earned Parrish intense praise for his writing, arranging, and playing, as well as for drawing out the best in his cohorts on the date. “Parrish’s own work veers between elegant, Latin-based tunes (“Twain,” “The Trouble With Me,” “Sophia”) and deep-swinging hardbop (“This One’s for Al,” “Ben”),” wrote All Music Guide about his original compositions. “The “Seven Steps” arrangement is especially slick,” said AllMusicGuide: “the three-chord sequence that ends the A section becomes a half-time funk vamp and the bridge accelerates to a breakneck seven.